Another week in Switzerland, another hard week of training. I’m still enjoying Zermatt immensely and have plenty of new places to run in. This past week has been a lot shorter time and distance wise, but the big runs have been harder. I’ve also been finding it difficult to get enough sleep recently, although I have a feeling its to do with the church’s bell which is only 100m from my accommodation. It goes off every 15 minutes and on the half hour they seem to like making it go for 5 minutes at a time.. Not the nicest way to wake up. Anyway, onto what I’ve been up to! Monday was a well timed rest day, because to my delight, it started snowing!! It snowed heavily all day so I had a lovely rest wrapped up in blankets with some TV show’s. Tuesday was my first big run this week and it was pretty tough. I planned to run up to Schwartsee which is located at 2583m above sea level on the north eastern ridge coming off the Matterhorn. From there I would head west up the valley to join back onto where I’ve been doing my tempo runs. Like all the big runs I’ve done here it started with 1000m of climb in around 6km, although this time it was in snow. Most of the time it was roughly mid shin to knee deep, but once I reached 2300m it was above knee deep, and in some places mid thigh!! It was definitely not the day for shorts.. My bad, I got a lot of scratches on my shins from the snow and had to stop frequently to warm them up in the last 500m to Schwartsee. When I got there, to my disappointment the access roads I was planning on running down weren’t clear. So I had to retrace my footsteps down until I got to the point where I could head up the valley to make up the missed distance. In total I ran 15.27km with 1100m climb in 2hrs 20mins. Wednesday was a pretty chill rest day. I relaxed and went for a couple of short walks. On Thursday I had hillsprints planned so I cruised around for my warm up to find a good place to train. I did 10 x 100m sprints on a 15% incline with 2mins rest after every one. I hadn’t planned for 2 minutes rest between each one, but I ended up needing that time to get my breathing under control and walk back down to do another. After the 7th sprint I was really getting into oxygen debt, my head was a little sore, I felt dizzy, and my eyes were taking an extra moment to focus on anything. I would compare the feeling to the time I went two nights without being able to sleep. It was weird! I took about 32mins for this training. Friday, was a fun run for me, I wanted to explore an area of Zermatt I hadn’t been to yet, so I cruised around for an hour and 15 minutes doing 400m of climb during the 11.76km run. The highlight of this run was at the highest point where I went over a suspension bridge that is 100m long and 90m high! Woo! Friday was a good day. Saturday was another mission up the mountains. This time I planned to run to the Unterrothorn and then weather permitting to the slightly higher Oberrothorn, I ended up only going to the former due to snow covering the tracks to the latter. Although I wasn’t too worried as I still reached a new altitude record for me of 3104m !! It was a very tough run, mainly because of how steep it was. In the first 7km I climbed 1000m, which was to the highest point I reached on my first run in Zermatt. From here onwards it began to rain and hail. In the last 1km to the top of the the Unterrothorn there was 500m of climb. I ran what I could, but had to power walk and climb sections of it. 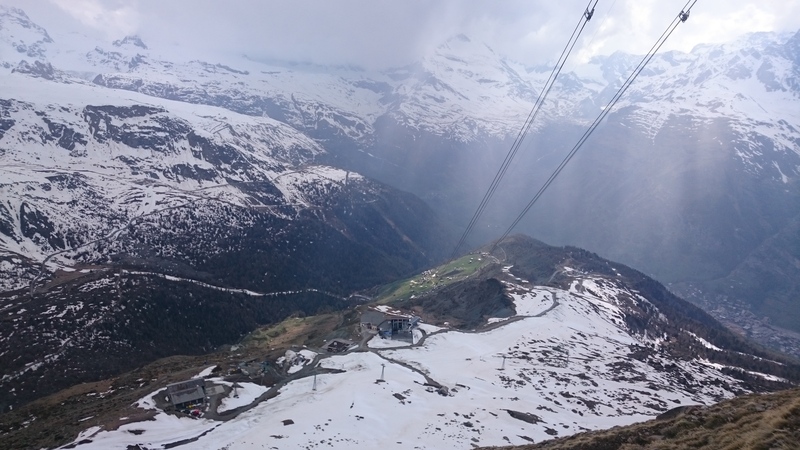 When I reached the top I was rewarded with the stunning view of the surrounding area, being able to see all the way back down to Zermatt. I decided it would be nice to have a short rest before heading back down the hill, so I got out a sandwich and my UE boom speaker and had a little party to myself at the top of the mountain. After a while my hands started to get cold as my gloves had gotten wet from the persistent hail. So I ran down the hill quickly to get back to the warmth of my hotel. This has got to have been one of the steepest runs I’ve ever done, climbing a total of 1500m in the first 8km which is on average a 18.5% incline! The whole run was 16.2km in 2hrs 33mins. With the feature photo above at the steepest section on this run. My last day of the week was planned to be 10 hard efforts of 1min 15secs… But my quads were very sore, so reluctantly with the rain helping to convince me, I decided to switch Sunday’s training with Monday’s rest, so you’ll have to wait until the end of the week to find out how it went! My totals for this week are a good bit little lower than last week but I still feel satisfied with my training thus far. I did 46.75km of running in 6hrs 36mins with 3200m of climb. This week has been a lot of fun with some new unique experiences for me, and I feel I’m making good progress. I’m excited for the weeks to come! !